Health Fair Connections | Am I in the health fair? If you're ever worried you might have missed an email notification from HFC, related to the status of a particular health fair, you can quickly log in to your profile on healthfairconnections.com and see that information on your dashboard. It takes less than 10 secs. As you can see above, there are three sections on your dashboard overview related to your status in health fairs. The pending list is where you find your list of health fairs that are still undecided on your participation. You'll have to sit back and wait on these events until a decision is made. Some hosts will provide you a response within hours or days. Some it might be weeks. Keep this in mind: If you have not heard from a host (approved or denied) within seven days of the event, don't plan on attending. And this does not mean to contact the host directly. If they did not approve you, it means you were not selected. If you decide you no longer can wait for a decision (or can't attend for any reason), be sure you go into the pending section and click, "take action" and then click, "withdraw interest." Clicking "withdraw interest" will notify the host, and remove you from the interested vendor list. If you have health fairs under this section, it means you are approved by the host to attend! But you're not home yet. 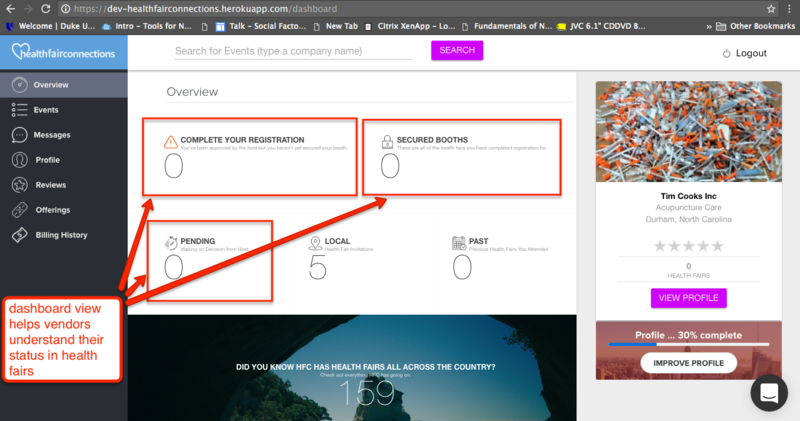 Officially registering for a health fair booth is two-step process on HFC, and completing the last step of registration is critical in securing your booth. The host needs to know if you need electricity, who's the rep attending for your company, do you want wifi, and if you have any special requests. So be sure you knock the last step of registration out once you're aware you have been approved by the host. This section is the place where you can always log in and make sure you're all set, schedule-wise for the health fairs you're registered to attend. If you can no longer attend, you know what to do. Click "take action," and this time you'll click "cancel my registration." Please do not leave yourself on the registered list and then not attend the event, as this will lead to a negative review from the host. Hope this helps, and thanks for reading!